We assessed the efficacy of fibrin sealant (FS) and tranexamic acid (TXA) administered topically in patients with a hip fracture treated with prosthetic replacement. Parallel, multicentre, open label, randomised, clinical trial. We compared three interventions to reduce blood loss: (1) 10 ml of FS, (2) 1 g of topical TXA, both administered at the end of the surgery, and (3) usual haemostasis (control group). The main outcome was blood loss collected in drains. Other secondary variables were total blood loss, hidden blood loss, transfusion rate, average hospital stay, complications, adverse events, and mortality. A total of 158 patients were included, 56 in the FS group, 52 in the TXA group, and 50 in the control group. The total amount of blood collected in drains was lower in the TXA group (148.6 ml, SD 122.7 in TXA; 168.2 ml, SD 137.4 in FS; and 201.5 ml, SD 166.5 in control group) without achieving statistical significance (p = 0.178). The transfusion rate was lower in the TXA group (32.7%), compared with FS group (42.9%) and control group (44.0%), without statistical significance (p = 0.341). There were no complications or adverse effects related to the evaluated interventions. 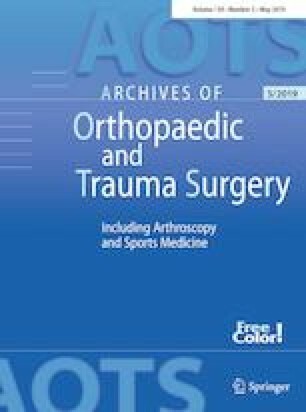 The use of TXA and FS administered topically prior to surgical closure in patients with a sub-capital femoral fracture undergoing arthroplasty did not significantly reduce either postoperative blood loss or transfusion rate, compared with a group that only received usual haemostasis. TRANEXFER Group memebers list are given in “Acknowledgement” section. We thank patients who agreed to participate; secretaries, nurses and in general, the staff of Clinical Epidemiology and Publica Health Department-Iberoamerican Cochrane Centre and Tramatology Department of participant centres. To Andrea Cervera for editing the manuscript. Dr. Jordan used this study to develop his PhD at the Universitat Autonoma de Barcelona (Spain). Dr. Mª José Martinez Zapata is funded by a Miguel Servet research contract from the Instituto de Salud Carlos III (CP15/00116). This project was funded by the Ministry of Health and Social Policy, Spain. Directorate General of Pharmacy and Health Products. “Projects for the translation of the advanced therapeutic application of human medicines, orphans and advanced therapies”. This study also received funding from European Regional Development Fund (FEDER; “A way of making Europe”). Number of project: EC11-341. TRANEXFER Group is also composed by: Julio De Caso: Orthopedic and Traumatology Service. Hospital de la Santa Creu I Sant Pau, Barcelona, Spain, e-mail: JCaso@santpau.cat. Ion Carrera: Orthopedic and Traumatology Service. Hospital de la Santa Creu I Sant Pau, Barcelona, Spain, e-mail: ICarrera@santpau.cat. Angie Millán: Orthopedic and Traumatology Service. Hospital de la Santa Creu I Sant Pau, Barcelona, Spain, e-mail: AMillan@santpau.cat. Mª Carmen Pulido: Orthopedic and Traumatology Service. Hospital de la Santa Creu I Sant Pau, Barcelona, Spain, e-mail: MPulido@santpau.cat. Marius Valera: Orthopedic and Traumatology Service. Hospital de la Santa Creu I Sant Pau, Barcelona, Spain, e-mail: MValera@santpau.cat. Xavier Crusi: Orthopedic and Traumatology Service. Hospital de la Santa Creu I Sant Pau, Barcelona, Spain, e-mail: XCrusi@santpau.cat. José Antonio Fernández Núñez: Anesthesiology Service. Hospital de la Santa Creu I Sant Pau, Barcelona, Spain, e-mail: JFernandezN@santpau.cat. Anna Canalias Bage: Orthopedic and Traumatology Service. Hospital Universitari Mútua Terrassa, Barcelona, Spain, e-mail: anna.canalias@gmail.com. Anna Alavedra: Orthopedic and Traumatology Service. Consorci Hospitalari Parc Taulí, Sabadell, Barcelona, Spain, e-mail: aalavedra@tauli.cat. Margarita Novellas: Anesthesiology Service. Hospital Universitari Terrassa, Barcelona, Spain, e-mail: mnovellas@mutuaterrassa.cat. Francesc Anglès Crespo: Orthopedic and Traumatology Service. Hospital Universitari Mútua de Terrassa, Barcelona, Spain, e-mail: fangles@mutuaterrassa.es. Gerard Urrutia: Public Health and Clinical Epidemiology Service-Iberoamerican Cochrane Centre. IIB Sant Pau. CIBERESP, Barcelona, Spain, e-mail: gurrutia@santpau.cat. Esther Cànovas: Iberoamerican Cochrane Centre-IIB Sant Pau, Barcelona, Spain, e-mail: ecanovas@santpau.cat. This project was funded by the Ministry of Health and Social Policy, Spain. Directorate General of Pharmacy and Health Products. “Projects for the translation of the advanced therapeutic application of human medicines, orphans and advanced therapies”. This study also received funding from European Regional Development Fund (FEDER; “A way of making Europe”). Number of project: EC11-341. All procedures involving human participants were in accordance with the ethical standards of the institutional and/or national Research Ethics Committee and with the 1964 Helsinki Declaration and its later amendments or comparable ethical standards.